EE has launched its own home television service - EE TV - promising Freeview, On Demand, and Catch Up across multiple devices. The new service allows customers to watch a bit of tele on their TV sets, as well as on three other smartphones or tablets around the house. What's more, different devices can view different programmes at the same time, meaning your not burdened by your household's questionable viewing habits. 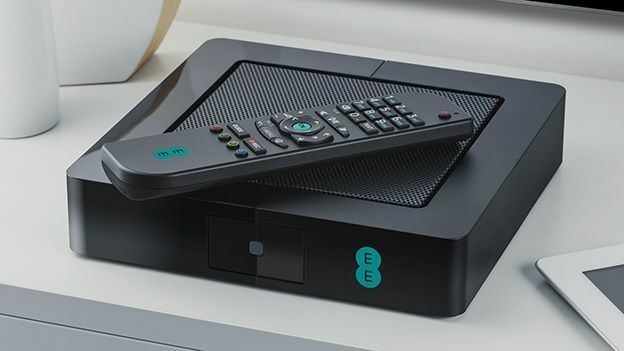 EE TV is free for those with broadband and landline packages, which currently start from £9.95 every month. Olaf Swantee, EE's CEO, reckons EE TV is 'the most advanced TV service' we've ever had in dear old Blighty. "As the UK's biggest and fastest network, with more than 25 million customers, we have unrivalled insight into people's changing viewing habits," explains Swantee. "It's helped us create a service that has mobile at its heart, and makes the TV experience more personal than ever before." The service comes in the form of a smart box that offers multiscreen, multirecord, 24-hour window replay, and a dedicated smartphone app that doubles your device up as a remote control. EE TV will land with 70 Freeview channels built in, as well as a host of video apps and on-demand services. Launch services named so far include BBC iPlayer, Demand 5, YouTube, Daily Motion, and Wuaki.tv. EE says its set to expand its audiovisual roster 'in the coming months'. The smart box is, apparently, worth £300, although its completely free if you pick up one of a selection of EE's packages. The service should be compatible with all UK TVs, and will be available exclusively at EE's brick-and-morter stores in the near future.